WOW! That is a very short summary of my recent trip to the Misool Ecoresort in Raja Ampat, Papua, Indonesia. I am still getting over my jetlag, but starting to process my new images. I shot a variety of subjects from wide-angle soft coral underwater landscapes to above water remote beach sunsets, but some of my favorite images are of the anemonefish. I have wanted to photograph them ever since I first saw them underwater during my visit to Indonesia in 2000 and later while watching “Finding Nemo” hundreds of times with my daughters. It took me a few years, but I finally had the opportunity during this trip. These fish are constantly darting around in an agitated state while having a cute expression on their face, which makes them very frustrating to photograph. I spent 20-30 minutes patiently waiting for this clownfish to move into the most aesthetic position, all the while I photographed a hundred or more pictures that required immediate deletion. 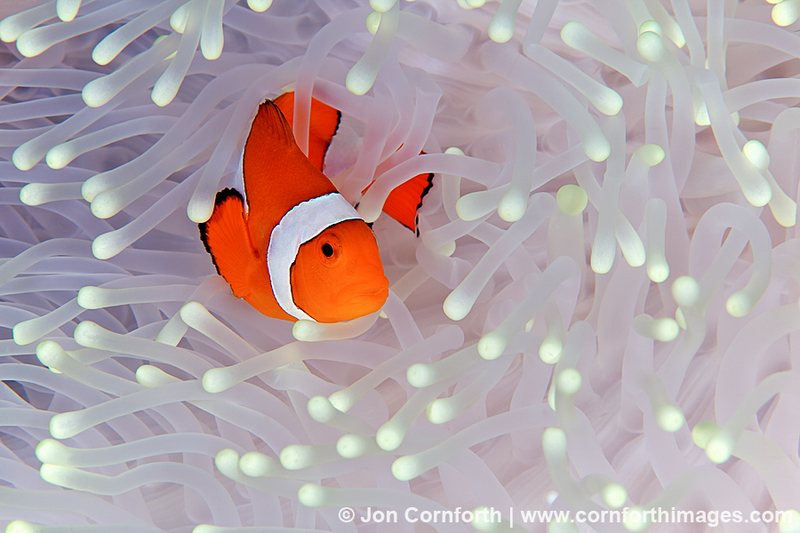 This image resonates with me for the head-on pouty expression on the clownfish’s face as well as the symmetry of the color and texture of the anemome around it. I created this image using my Canon 5DmkII and 100mm f2.8 macro lens in my Ikelite 5DmkII housing with dual Ikelite DS160 strobes set on TTL. This image required minimal processing using Aperture 3 and Photoshop CS5.